OLAPLEX™ - A new and revolutionary add-on hair treatment for coloured hair is now available. This product is revolutionary in the hair industry. The results are incredible! 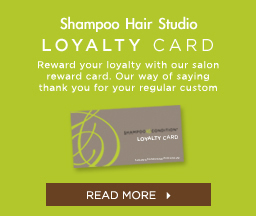 Ensuring you are left with the strongest, shiniest, and healthiest hair possible. OLAPLEX has been extremely successful in the USA and will do the same here in the UK. Already loved by celebrities such as Charlize Theron and Kim Kardashian. OLAPLEX treatment limits the damage to hair during or after colouring. It is designed to reconnect the disulphide bonds in the hair that are broken down by the colouring/lightening process. Ask for Olaplex to be added to your next service and see the AMAZING results for yourself. Available with colour or as a stand alone conditioning treatment. Now you can try this for the first time with a 50% discount when included with your next hair colour. Aveda's Botanical Therapy Colour and Hair Spa Service has arrived at Shampoo Hair Studio, Storrington. Experience the ultimate in hair colour and enjoy Aveda's up to 96% naturally derived Hair Colour. Visit www.aveda.co.uk for more information. 30% off a Cut and Blow Dry with Amy. Buy 1 Therapy Age-Defying Radiance Oil at Shampoo Hair Studio to receive a COMPLIMENTARY Therapy luxury hair treatment with your next visit. This offer is separate and not combined with any other offer at the same time. Transform your hair - Dull, frizzy, curly, wavy, dry damage, or just unmanageable? BOOK NOW for our innovative treatment: Straightening; Repair; Shine; Time-saving; Manageability. It is in our clients interest to prolong the lasting effects of their Kerastraight treatment to use both the Kerastraight shampoo & conditioner. Using other shampoos and Conditioners can often strip this treatment and effect its longevity. Therefore in our policy to ensure the use of correct products we are currently offering the Kerastraight gift pack (which includes either a hair mask or oil) or their Shampoo & Conditioner at just HALF PRICE. One per client when purchased at the same time as their treatment.